Although I’ve finished a few projects in the past month, I’ve been a little bit slow in getting the FO photos together. My Cassidy cardigan is one such casualty. I finished it in time to wear at Rhinebeck – yea verily, I was sewing on the buttons the night before – which was darned useful as I knitted it in Ultra Alpaca and it stood me very well as a warm outdoor garment. This past Saturday I wore it into Toronto for my yarnly engagements – a class at the Naked Sheep, and hanging-out time at the Purple Purl – and got Jennifer to take about a bazillion pictures of me while I was at the Purl, figuring that there would be at least a couple of shots that turned out. Turns out yarn shops make good photography backdrops, as one might well anticipate. Modifications: The only thing I did differently was to add length, as I usually do. It adds up to about 1.5 ins added both before and after the waist shaping. The waist then sits where my actual waist is, and covers my hips comfortably. Tall girls unite! Modifying patterns for length since time began. This is a very comfortable sweater, the Ultra Alpaca is a gorgeous, heathery shade of turquoise, and I have been getting nothing but compliments on it when I wear it out and about. 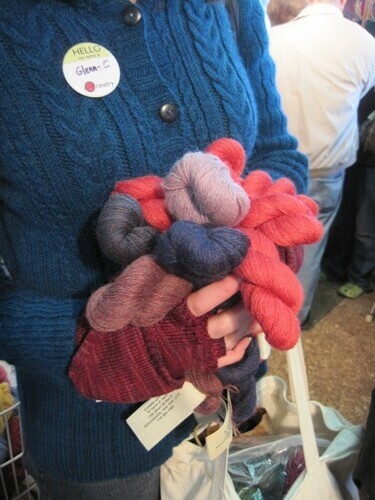 I am even contemplating doing a second one some time in the future…or at the very least, more Ultra Alpaca sweaters. I love this yarn to bits and pieces. While I’m here, let me just put in a PSA for the benefits of working sweaters in pieces. Now, there are different forms of sweater construction and I’ve done several of them. I think there are times when working a sweater in the round is appropriate and enjoyable, and I’ve done many sweaters in the round. Sometimes it’s because the pattern told me to, other times it’s because I’ve preferred it in the round and modified the pattern to suit my interests. 1. Portability. I knitted about 2/3 of this sweater over 2 weeks, largely because every time I got on a bus or train, I pulled this out of my bag. It is a lot easier to carry around a piece of a sweater to knit one at a time than to eventually be carrying around most of an entire sweater, which you will be doing at some point if you work it in the round. 2. Structure. Here i used Ultra Alpaca, which is 50% wool/50% alpaca. Alpaca is wonderfully warm and drapey, but also much less elastic and springy than wool. As a result, things made with alpaca and, to a certain extent, alpaca blends, will want to sag and stretch a little bit more than things made with plain wool, which bounces and blocks right back into place after you handwash it. Seams add structural integrity and strength to the garment, and sometimes you want a little bit of extra of that to go around. 3. Control. Cassidy, as you can see above, has a hood. If I had done the sweater all in the round bottom-up and attached the sleeves as I went, I would have ended up working the hood with the entire weight of the sweater in my lap. When you’re working the hood back and forth up there at the neck, you’re flipping back and forth and it can be cumbersome to do that with a whole sweater. Here, I seamed up only the body, worked the hood, then attached the sleeves last. And you know, the truth of the matter is, I don’t mind seaming. Well, I mind it in the same way that I mind pretty much any finishing steps in the sense that it is the thing standing in the way of me wearing the item and this sometimes annoys me enough to avoid it as long as possible (seriously, I have been known to procrastinate 2 weeks on two little ends to weave in on a shawl. Two), but now that I know how to do seams and how they should look, I don’t mind them as much as I did when I was first knitting sweaters as a new knitter. It gets easier and better with practice, like most other things. And then when you finish it all, you have a really comfortable and pretty sweater that even Fiona Ellis herself will compliment you on when you wear it to her class. More on that tomorrow! May your Monday be as painless as possible, with knitting waiting for you at home. It’s beautiful! That color really suits you! gorgeous, as usual! can you share how much ease you decided to include (negative/none/positive)? i still struggle with how to get exactly the fit i want, and your sweaters always fit so nicely! I kinda like seaming too, but I think the person who invented tying in ends should be shot!! The sweater is gorgeous! You always do such beautiful work. You haven’t convinced me about finishing, however. I have been known to discard patterns if they aren’t done in the round. Oddly, I like seaming, too and am actually pretty good at it. I always dreaded seaming but that was before I actually did it once and realized it’s not nearly as hard as it has to be. loved it!! what a great cardigan. I completely agree with you on the seams=structure argument. I am one of those crazy peeps who LOVES seaming and finishing. I will stay up ’til all crazy hours in the night finishing the knitting part so I can dedicate the next day to finishing. 2010 will be my sweater year and I can’t wait to start. Seeing your Cassidy has definitely confirmed that I need to add the pattern to my queue. That is if I have the yarn in my stash… which I don’t think I do…hmmmmm… maybe I will have to remedy that. It’s lovely. And as with ‘barefootrooster’ can you share the deets on the amount of ease? So beautiful with such a perfect fit. Thanks for inspiring me, I am going through a stage in knitting where nothing is working out right! Ripping stage! On sweaters I go back and forth on how much ease I want, but it largely depends on the style and what I think will work. I.e. for Autumn Rose, it was a pullover and meant to be fitted, so I went pretty close to actual bust circumference. With this one, I knew it would be a little more casual, so I eased at about 3 inches of positive ease around the bust. Worked out well! What a beautiful sweater. It looks SO complicated. And thanks for sharing your thoughts on alpaca. That is one fiber that makes me a bit nervous to work with. Beautiful FO! I love that colour. You are so good at making things that fit you perfectly! It’s perfect — the colour, the fit, everything. I loathe seaming. I suspect it’s because I haven’t really learned how to do it properly. Must. Learn. You did do a beautiful job on Cassidy! I am good at seaming, I just don’t like to do it. So I adapt my patterns to minimize seaming whenever I can. 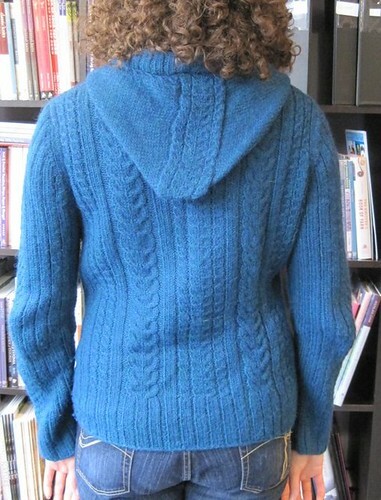 And I’m a big fan of 3 needle bind offs at shoulders, still providing structure and stability. Maybe I’d feel different if I commuted by public transit and had that time to knit but needed projects to be a bit more portable. So pretty! The color’s gorgeous, and I love all the cables. I recently knit a cabled cardigan in chunky yarn, and doing it in pieces was definitely the ticket. Even so, the pieces were really big and heavy — I wouldn’t have wanted to deal with it in top-down form. That said, I love how quickly top-down sweaters seem to go! Once again – perfect fit – beautiful job! Very nice! I’m with you on the seaming, for structure and as an obstacle in finishing: it’s not that I dislike it, and the seams even look half decent, but I just want to WEAR IT NOW!! Which is why I have very little trouble weaving in ends if that is all that stands between me and a new pair of socks. You look so good in Cassidy. It’s gorgeous. It’s interesting to read about knitting in pieces & seaming as I hate seaming & always knit in the round. These picks may make me move it up the queue! Finishing *is* fun – and the sweater looks fantastic. I love the back, especially. Lovely sweater! I’m tall too. I’ve never met a sleeve I couldn’t lengthen to good effect. I think finishing is neither good nor bad. It just is a part of the whole. Procrastinating on the finishing would be like reading a good book up to the climax then not reading the denouement for a couple of weeks. It’s really lovely. And the fit is perfect. I agree with you about seaming adding structure to a garment. In fact, I used the same logic in working up one of my sweaters and it makes lots of sense! Beautiful sweater! 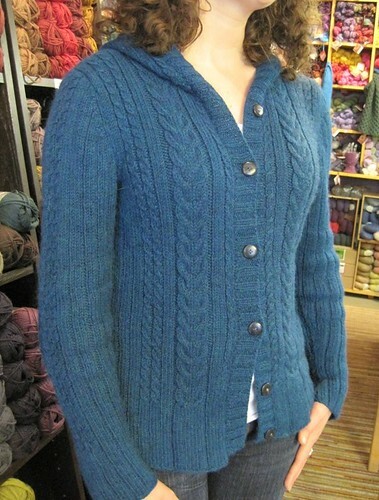 I have been contemplating this pattern for some time, now I am definitely adding it to my to-be-knit list. And I, too, may make that same modification that you did…at 5’9″ I know all to well the horrors of knitting sweaters that are just too damn short. For me it is always the sleeves that get me…I am always adding length there! Your Cassidy fits you like a dream! Another gorgeous sweater! You are such a fantastic and talented knitter!